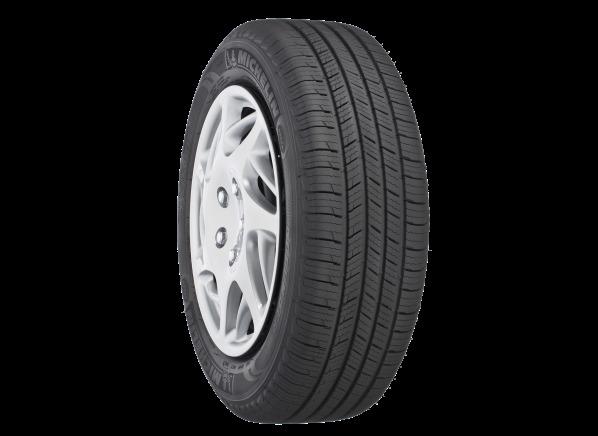 An all-season tire suitable for many family cars, small SUV's and light duty trucks. The Defender has an impressive 90,000 mile warranty, in-line with the wear potential determined by Consumer Reports own test results. The Michelin Defender is part of the Tire test program at Consumer Reports. In our lab tests, Tire models like the Defender are rated on multiple criteria, such as those listed below. Dry braking: Dry braking is measure of stopping performance from 60 to 0 mph. Wet braking: Wet braking is measure of stopping performance from 60 to 0 mph. Handling: For most tires, Handling includes how well the tires perform; in an avoidance maneuver involving a swerve into the left lane and back into the right lane; on CR's wet handling circuit; and steering feel. Speed rating Speed rating Speed rating. This letter denotes the maximum sustainable speed and is found directly after the load index. For S-speed-rated tires, it's 112 mph; for T, 118 mph. Speed ratings for other tires include Q, 99 mph; H, 130 mph; and V , 149 mph. Some tires have speed ratings of W, 168 mph and Y, 186 mph. While such speeds may seem wildly impractical, tires with higher speed ratings tend to provide better handling at legal speed limits. Choose tires that have a speed rating at least as high as the one specified on your vehicle's placard or consult your vehicles owner's manual. Treadwear warranty Treadwear warranty Commonly used by tire manufacturers to market tires, the warranty describes the typical tread life of the tire. Actual mileage will vary with vehicle type, driving style, road, and weather conditions, just to name a few variables. Typically, credit is based on the mileage not received. UTQG treadwear UTQG treadwear UTQGS, which stands for Uniform Tire Quality Grading System, is a federal government required grading system for passenger tires excluding winter tires. Key information includes Treadwear, Traction, and Temperature appearing on the sidewall of a tire. UTQG treadwear, an index developed by the government, compares a tire's tread life with that of a reference tire graded at 100. A tire with a grade of 300 is predicted to last three times as long as one graded at 100. Treadwear grades are just one indicator of tread life, but actual tire life will vary due to a number of factors including road conditions, driving habits, vehicle, and maintenance. UTQG traction UTQG traction UTQGS, which stands for Uniform Tire Quality Grading System, is a federal government required grading system for passenger tires excluding winter tires. Key information includes Treadwear, Traction, and Temperature appearing on the sidewall of a tire. UTQG traction indicates the tire's ability to stop on a wet surface with Government grades of AA, A, B, C, from best to worst. UTQG temperature UTQG temperature UTQGS, which stands for Uniform Tire Quality Grading System, is a federal government required grading system for passenger tires excluding winter tires. Key information includes Treadwear, Traction, and Temperature appearing on the sidewall of a tire. UTQG temperature indicates the tire's ability to resist heat build-up under test conditions with Government grades of A, B, C, from best to worst. Size tested Size tested The size of the tested model. Available sizes 1 Available sizes 1 This model available in the sizes listed. Available sizes 2 Available sizes 2 This model available in the sizes listed. Available sizes 3 Available sizes 3 This model available in the sizes listed. Before buying, determine your correct tire size. Don't buy used tires. Used tires have an unknown service life and recall history. It's best to purchase four like tires at a time for optimum vehicle performance. Consumer Reports is an independent, non-profit organization dedicated to helping consumers. We make it easy to buy the right product from a variety of retailers. Clicking a retailer link will take you to that retailer's website to shop. When you shop through retailer links on our site, we may earn an affiliate commission – 100% of the fees we collect are used to support our mission. Learn more. Our service is unbiased: retailers can't influence placement. All prices are subject to change.